Normally when I write about updates on intrastate crowdfunding legislation it’s simply to let readers know that one, two maybe even as many as three states, have either enacted or proposed new legislation. Not this time however, as the first quarter of 2015 has brought an explosion of intrastate legislation. Maybe with the new legislative season, state politicians are looking for an arguably bi-partisan bill they think will be popular with their constituents. I mean who can say no to legislation designed to open up sources of capital to small and growing businesses? On the other hand, maybe state politicians/regulators are simply seeing other states enacting similar rules and they don’t want their state to be left behind. Whatever the reason, 2015 is shaping up to be the year of intrastate crowdfunding. To put this in perspective, the number of proposed bills as the end of 2014/beginning of 2015 was somewhere around thirteen (13) and the number of then states with enacted/effective intrastate crowdfunding regulations was somewhere around fifteen (15). That is a VERY significant jump if you ask me. Having reviewed each of the enacted and proposed legislation (yes, I have no life), I can say that many of the recent bills do have a lot of positives when compared to their earlier counterparts but many of them suffer from, what I believe, to be a very material roadblock. Cap Rates; Automatic CPI Adjustment: The majority of the proposed bills continue the precedent of setting the overall offering cap at $2,000,000 (provided they deliver independently audited financials, otherwise $1,000,000). However, a few of the states (e. Illinois and Minnesota) propose to allow for significantly higher offering caps, and certain of the states (i.e. New Mexico and North Carolina (HB 63 only), and South Carolina) have not included a cap at all. Moreover, many of the newly proposed bills specifically require the offering caps to be reviewed and increased every five (5) years to reflect changes in the Consumer Price Index (CPI). “Authorized” v “Chartered”: One of the issues that have plagued some of the previous legislation is that escrow agents and/or offering portals were specifically required to be chartered/formed within the respective state. Administratively, this turned out to be much easier said than done. Many of the currently proposed bills alleviate this roadblock by providing that such entities only need to be “authorized to transact business” within the state. While I believe the pros outweigh the cons in the majority of the currently proposed bills, there is one recurring provisions that I think will be a material issue in terms of actual application. The majority of the proposed rules exclude (generally) any “investment company” (as defined by the Investment Company Act of 1940, 15 U.S.C. sec. 80a-3) from using the proposed exemption. A detailed analysis as to why this exclusion is an issue is beyond the scope of this article. That being said, it is important to note that a lot of real estate holding/development entities are set up in a manner that would fall under the noted definition of “investment company.” Given that real estate investment has been one of the most popular forms of investment crowdfunding to date, states currently proposing legislation may want to consider tailoring this exemption much more narrowly (see my proposed language in the Illinois proposed bill, HB 3429). I said it before and I will say it again. The people want investment based crowdfunding for the masses and, in the absence of federal regulation, they will find a way to make it happen. This would explain the rising popularity of intrastate exemptions. However, passing the legislation is only the first step. Even in states that currently have effective exemptions, the use of such exemptions has been very slow. I truly believe that this is more a reflection of a general lack of public knowledge as to what these exemptions do and how to use it rather than an expression of the effectiveness of any exemption itself. 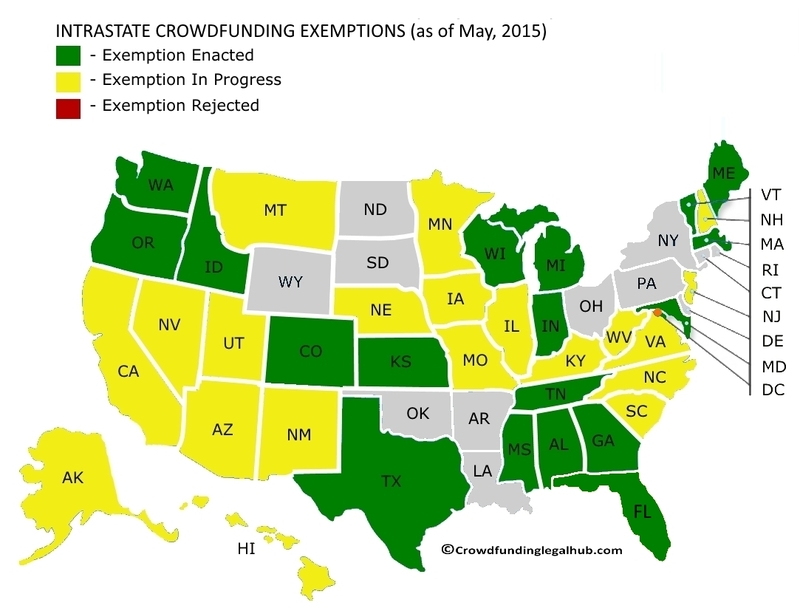 States that currently have (or are proposing) intrastate crowdfunding exemptions NEED to also actively work to get the word out to the target users of these exemptions.